the landscape for better water-efficiency. 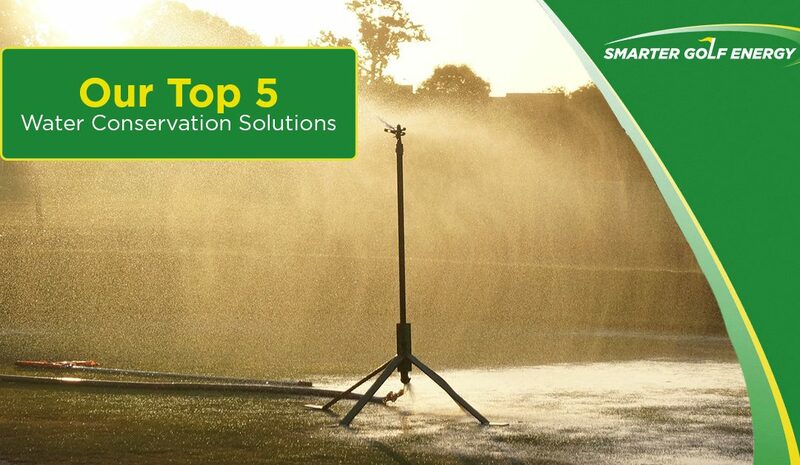 In this final article, we’ll explain our top five water conservation solutions. Before you undertake any water conservation efforts, engage a professional to perform a thorough site reconnaissance to determine water savings potential at any golf course. Beyond this, an irrigation audit will often uncover inefficiencies that can be corrected with simple maintenance. A sprinkler nozzle, for example, is a simple and low-cost remedy to distribution inefficiencies—and pumping less water means a longer pump life and lower energy consumption. Water audits performed across the UK suggest that many golf courses could save themselves 50 000 to 500 000 gallons (190-1 893m³) per annum, or more, with more efficient irrigation. Modern irrigation systems can be programmed to apply water precisely to where it’s most needed, and in the exact quantity. Variegated irrigation heads apply water only to targeted areas while soil moisture sensors and weather-based irrigation controllers (WBIC) built into the systems can automatically adjust irrigation schedules (the rate or frequency of application) to suit local conditions. Adjust irrigation coverage to concentrate on high-maintenance zones during droughts. Entering the dryer times of the year, when water supply recharge is minimal, zone coverage can reduce irrigation application by up to 70% under drought conditions to prolong the water supply. To curb water loss, make leak detection an integral part of your irrigation system management. Know your plants’ water needs to understand where to prioritise water use. For instance, plant growth regulators can cut down water use by about 11% per year, while employing wetting agents or soil penetrants helps ensure the water you’re using will be readily absorbed into root systems. Don’t skip routine golf course maintenance practices. Aeration, sand topdressing, verticutting and a good fertility management programme reduce soil compaction and allow better moisture penetration, saving water usage in the long-term. Identify the patterns of heavy play for high handicap—reducing high maintenance turf areas must consider the golf course’s playability and pace of play. Ensure your mower blades are sharp and reduce the height of the cut in the rough. Consider hand watering instead of turning on irrigation heads. Wash equipment with pressurised air rather than water. If you’re not already doing so, add soil moisture sensors to your golf course maintenance toolkit. Far more efficient and affordable than in the past, these sensors provide exact information in real time on turf moisture content that’s not based on opinion, thumbsuck or guesswork. One Arizona golf club, for instance, acting on information provided by soil moisture sensors, saved 500 000 gallons of water per night, after turning off irrigation in just one zone one night per week. On sites where a natural water supply is limited, alternative sources of water, such as effluent or recycled water, can be used to reduce the use of groundwater or offsite water supplies. Golf courses provide an excellent opportunity to supplant potable water with reclaimed water. Landscape irrigation is the most obvious opportunity to use this water, especially fairways and surrounding roughs, but it’s important to note some vegetation for the greens cannot tolerate the high total dissolved solids levels of reclaimed water. Given the suspended matter content of recycled water, a dependable irrigation filtration system may be essential, especially if recycled water is stored in ponds, where algal bloom is a constant problem. Reclaimed water can also be used to supply water to ablution facilities and many cooling towers too. Stormwater is a valuable source of water on a golf course but runoff from impervious surfaces such as car parks and roofs can contain damaging pollutants. There are three different approaches to stormwater management—detention, filtration and infiltration. Often a combination of all three is required. Water retention ponds capture landscape run-off and with excess water, act as water reservoirs, helping to reduce demand on other water sources during peak irrigation times. Use ponds located adjacent to a watercourse to skim flood flows, diverting excess water through a channel to storage facilities. Where feasible, tap sewer lines for water skimming. All these practices can reduce water use on a golf course when employed individually, but the most successful programme deploys all these practices in a holistic approach to water conservation. Yet implementation can be time-consuming for already-stretched golf course managers, which is where an expert utilities broker can help. Smarter Golf Energy’s experienced consultants can help golf courses manage, monitor, and save on their water costs. Contact us here to get more expert advice on how you can save with our smart water solutions.